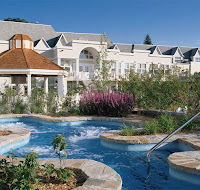 Montreal, Quebec -- September 5, 2008 -- Spas of America, the fastest-growing spa travel website, today announced new member spa listings for Amerispa and its eight Quebec resort/hotel spa locations. Montreal-based Amerispa, one of the leading spa brands in the industry, operates prestige spas in choice locations throughout "la belle province." "We are pleased to showcase Amerispa to our targeted spa travel audience," says Spas of America president Craig Oliver. "Their presence on our website benefits our existing spa listings and provides our customers from around the world with eight fabulous Quebec options when seeking exciting and rewarding health and wellness travel experiences." Louise Brossoit, vice-president of Amerispa, says: "Our spas illustrate a variety of resort and hotel experiences and are a perfect complement to the natural beauty and history of Quebec. We're excited about introducing our one-of-a-kind experiences to Spas of America's global audience." Each Amerispa location on Spas of America has its own unique full-page listing complete with a 300-word description, 10 images, a detailed map and complete contact information. Spa aficionados will delight in the 'You Deserve' treatment at each location. At Le Château Bonne Entente, guests can experience Amerispa's Bamboo and Lotus massage. This treatment combines a relaxation massage with an aquatic-plant cocktail mask, with bamboo, water-lily and lotus extracts. This hydrating experience softens the skin for an exquisite moment of well-being. All Amerispa locations can be viewed at www.spasofamerica.com/lifestyle/wellness/amerispa. Spas of America is a global online media company focused on healthy living and travel. The Spas of America website showcases over 600 of the best day, resort, hotel and destination spas in the United States, Canada, Mexico Caribbean and South America to spa travelers around the world. Since the site launched in 2005, over a quarter million customers have visited www.spasofamerica.com. Spas of America also operates the websites spasoffrance.com, spasofitaly.com, spasofdubai.com and spasoflife.com.